Only 12 days left! Want to know more about the players?Check out or interview page that you fi9nd under PARTICIPANTS in the top menu. During the first round of this year’s tournament, regular commentators GM Brynell and GM Seirawan will be joined by GM Hellers, winner of the very first Sigeman & Co Chess Tournament in 1993! GM Yasser Seirwan joins GM Stellan Brynell in live commentary! 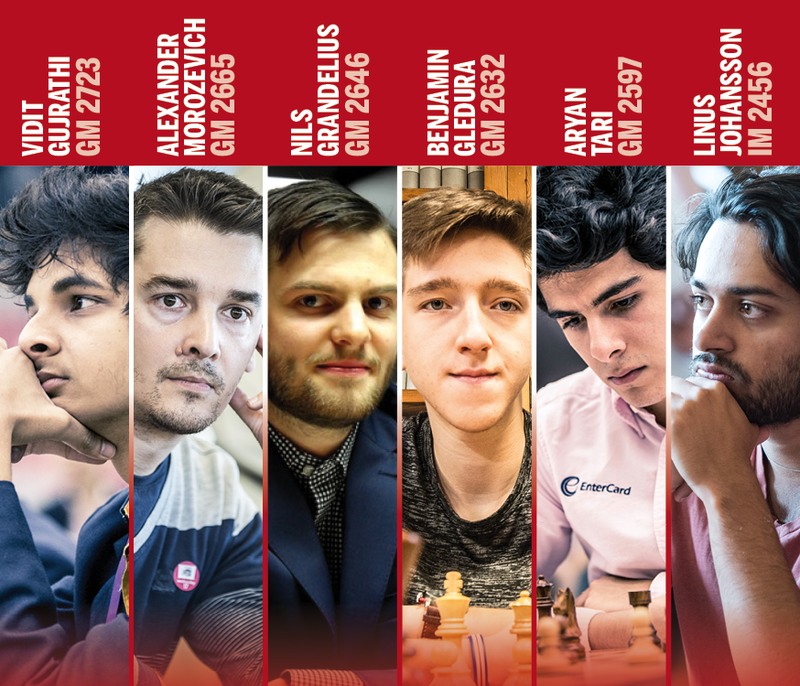 GM Vidit Gujrathi, GM Alexander Morozevich, GM Nils Grandelius, GM Benjamin Gledura, GM Aryan Tari and IM Linus Johansson. As in previous years, the tournament will be held at the Hipp Theater in Malmo and this year the dates will be 4–8th May, with a grand opening ceremony being held at the Malmo Town Hall on 3rd of May. The tournament will be broadcasted on web TV, and your hosts will be GM Yasser Seirawan and GM Stellan Brynell. Johan would like to thank the sponsors, who made it possible to revive the tournament. The tournament would not have been possible without the support of the law firm Sigeman & Co, and the company TePe – Sweden’s leading manufacturer of dental products. 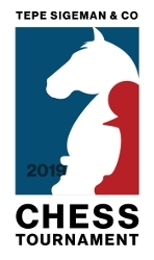 ”Both Johan Sigeman and Joel Eklund have provided invaluable support when it comes to bringing the field of players together and I would really like to thank them for making this possible, says Johan, who would also like to thank the Swedish Chess Academy for supporting the tournament”. Vidit Gujrathi, India: The winner of Tata Steel Challengers this year. Alexander Morozevich, Russia: One of the chess world’s most fascinating and famous chess players. He has been ranked number 2 in the world. Aryan Tari, Norway: The new world junior chess champion. Benjamin Gledura, Hungary: A great chess talent from one of the best chess countries in the world. ”With an average rating of 2620, this will most probably be the strongest closed tournament in Sweden this year”, says Johan Berntsen. ”This is due to the fact that the TePe Sigeman & Co Chess Tournament builds on a strong tradition and that the Sigeman tournaments always have had a very good reputation among the top players”, he says. Many of the world’s best chess players have participated over the years: Magnus Carlsen a former participant The current world champion, Magnus Carlsen, former world champions Vasily Smyslov and Boris Spassky, legends such as Judit Polgar, Viktor Korchnoi, Tony Miles, Jan Timman, Lajos Potisch, Alexander Beliavsky, but also many top players of today, such as Fabiano Caruana, Peter Leko, Hikaru Nakamura, Boris Gelfand, Teimour Radjabov, Anish Giri, Ivan Sokolov, Nigel Short, Vassily Ivanchuk, Ivan Cheparinov, Wesley So, Alexei Shirov, Chao Li, Richard Rapport, Loek van Wely, Pavel Eljanov and Laurent Fressinet. The first Sigeman tournament was played back in 1993, and was then played every year up until 2014, when it was laid to rest. For good, many feared. But, it came back in 2017. The format is the same as last year. Six players play five rounds in five days. The players praise the tournament atmosphere. Johan Berntsen sees a big advantage in TePe Sigeman & Co Chess Tournament being played at the Hipp theater. Above all, it is very convenient for chess fans who want to follow the tournament live. ”Hipp is right in the center of town, very close to all forms of public transport”. For media: Please feel free to use quotes from the interviews and download pictures of the players, but please quote the source.